miralax | Infertility, why me? Today is CD33, so any day now AF should be arriving…which will kick off the start of IUI #5. I’m ready to get started, I just wish AF would hurry up!!! Infertility is such a crazy thing. I’m embarrassed to say this, but silly ol’ me took a cheapie pregnancy test yesterday b/c AF still hadn’t come…. So, last time I talked about my stomach issues (read here) I told you that my doctor gave me 1.5 weeks of Amitiza to sample for my IBS-C. Well after trying the medication for a week I decided not to keep taking it. I really didn’t notice it helping much at all with my bowel movements, and around 3:00 pm every day I had the world’s worst heart burn. I had a pain in my chest that WOULD NOT go away, for hours….very painful. 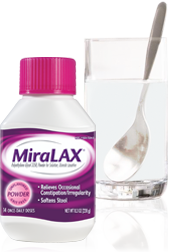 For now, I’ve decided to just “self medicate” myself by taking MiraLAX daily, and I think diet & exercise will help too.